Chinese New Year was on Wednesday. 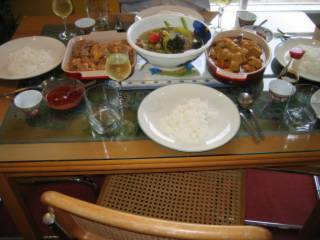 Mum did all the cooking, and started on Sunday, because we had to offer food to our ancestors on that night. Including, amusingly, a whole boiled chicken - complete with head and feet - which she had never done before and which freaked her out immensely. "Aiyo... the poor chicken couldn't fit in the pot! Its little head was bent so strange! Aiya! Don't want to cook chicken like that again!" Anyway, as tradition dictates, on new year's eve the whole family must eat dinner together. We have here our traditional Chinese New Year's eve feast (but every family and every region has its own unique traditions and customs). On the left, loh bak, kiam chye th'ng in the middle and curry chicken kapitan on the left. Plus a bottle of Cloudy Bay Sauvignon Blanc. Because we love it. Loh Bak is traditionally made with minced pork, but seeing as I don't do pig, my mum makes it with minced chicken. What it is, is minced spiced meat, wrapped in soybean paper like a log, deep fried and sliced. You have it with tomato-chilli-sesame seed sauce and cucumbers. It's one of my favourites! Kiam Chye Th'ng is duck soup with mustard greens, mushrooms and tomatoes. Again, this traditionally has pork bones in it as well, but we leave it out. I love the salty-sour taste of this soup. And as a bonus, it lasts for ages because you keep adding things to it and reboiling. (E.g. today we bought some roast duck and whacked it in with extra mushrooms.) Basically it lasts until all the mustard greens are used up, I guess.